I have to tell you, dear readers, the tagline the New York Times gave to this absolutely breathtaking storyteller – the king of Christmas fiction – is becoming an understatement. 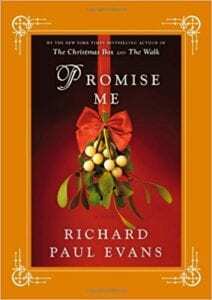 Personally, I have been a fan of Mr. Evans for as far back as I can remember and, yet again, he doesn’t disappoint with his newest “gift” for this year’s holiday season. Beth Cardall has what most women would consider an absolutely perfect life. She adores her wonderful six-year-old daughter, Charlotte, and her husband, Mac, is almost as charming and loving as a man can get. The only thing that disturbs Beth is the fact that Mac is on the road a lot because he's a salesman, so she has to spend many nights alone. She also works at the local dry cleaner with her best friend Roxanne to bring some extra money into the household. Soon, as a house of cards usually does, her perfect life begins to fall apart. One day, as she’s working in the dry cleaning store, she and Roxanne come across a note from a very affectionate woman in the pocket of Mac’s blazer. Not only that, but Charlotte begins to get extremely ill and no one – not Beth, the school nurse – no one, can figure out what is wrong with her little girl. Because of circumstances that I will not reveal, because I believe that absolutely everyone should have the opportunity to explore this novel for themselves, another man enters the story. On Christmas Eve, 1989, Beth enters a 7-Eleven and finds a breathtakingly handsome man named Matthew staring at her like he’s seen her somewhere before. Although the meeting feels more than a little odd to Beth, she begins to see Matthew all over town; and, he not only seems to know what’s ailing her daughter, but he also seems to know some of Beth’s most intimate secrets. It’s almost as if Matthew is an angel (which he’s not, by the way) sent down from Heaven to help see Beth through some of the most difficult times in her life. They begin to see each other quite a bit, as Matthew pretty much saves Beth from a life of pain and agony. When she finally finds out who Matthew really is, and how he knows so much about her, Beth can hardly believe his story. And, perhaps, she won’t believe until years later when a knock on the door shows Beth that she did make the right choice after all – giving up something she loved more than life itself to bring happiness to the little girl who was the center of Beth’s world. Every chapter of this story grabs the reader and holds on to their heart, mind, and soul until the very last page. As a mother who would give up her life for her own daughter, I was completely head-over-heels with the complete love, affection, elegance, and extreme class that Beth had in spades. Not only that, but this book begs so many questions, with the biggest one being: If you knew the future, would you change the past? If you absolutely saw beforehand how the good and bad moments were going to play out in life, would you give up all you could have in order to give someone else the life they’ve always dreamed about? I not only read this one, I put it on my bedside table because I truly want to read it again and again. THAT is how unbelievably powerful and uplifting this novel is. Quill says: This is the ultimate Christmas present for all the ones you love. At the beginning of each chapter there’s an entry from Beth’s diary for the readers to really sink their teeth into. Nuggets of knowledge such as – You can cheat time, but it always wins in the end – are words that will lock your eyes to the pages of this beautiful novel. The one that will touch a great many of us is the fact that, no matter how hard our “home” is, and how fast we “ran” away from it to see the real world – we will always take our problems with us. Why? Because it’s not the home that holds the pain and heartache, those emotions are carried in the traveler. Make this novel a beautifully wrapped present under your tree this year. You won’t regret it.